As a mom you still want cute things that are of course also comfortable …and make life easier too! How about compliments? Yes, we still like those. 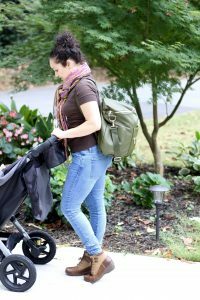 I found a diaper bag that has given me cuteness, comfort, compliments and is super easy to use and access items. 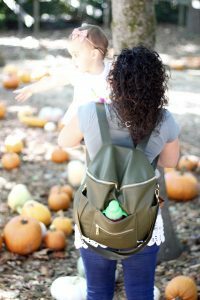 Fawn design, I’m falling for your diaper bags! I seriously think I need one in every color! 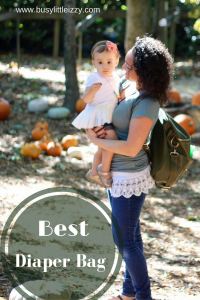 Guys you know I LOVE diaper bags. 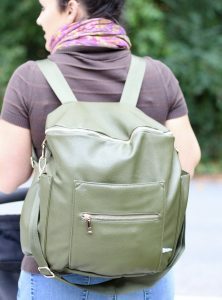 This is such a comfortable backpack diaper bag and this company has so many colors you are bound to find one for you! Of course for fall I had to have Olive! Isn’t it a darling bag? 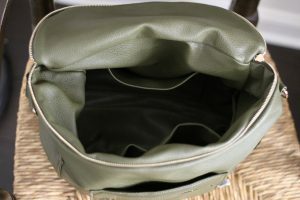 There are 3 pockets and a zipper pouch on the outside and 5 more on the inside as well. This diaper bag has allowed me to fit so much that I’m not carrying extra things in my hands, like her iPad. You just never know when you will need it. Everything we need fits! Not only does the bag wear as a backpack, but also cross body or on your shoulder. I forget I’m wearing this bag, until I get a compliment about how cute it is. Seriously, you guys know I can’t boast if it isn’t true. 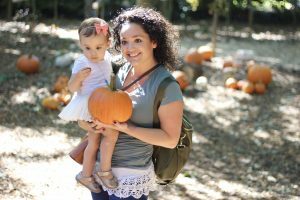 I’ve worn it running errands, going for a walk, walking around a pumpkin patch… everywhere! 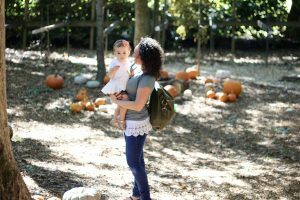 Not only is this darling bag perfect for me and all the other mamas out there, but it’s adorable on daddies too! Sorry I don’t have a photo for you, but it’s always a rare moment to snag a photo of my husband since he really hates photos. 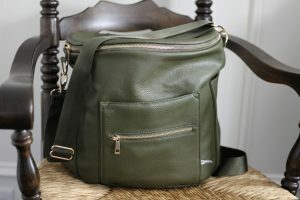 If you want to see dads wearing this diaper bag head to Fawn Design’s webpage or Instagram. It’s pretty adorable! Love that bag! The straps look super comfortable and the color is perfect! Drop dead gorgeous mama! You and that bag! Great bag! I love that you can wear it as a backpack! Thank you Stephanie! It’s so comfy! So cute!! 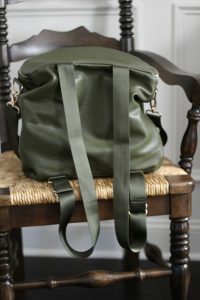 Love the olive color? Great photos!! !